Today, i have completed 2/3s of the raw food trial. So far, i have no idea what i want to do for food on the 31st. 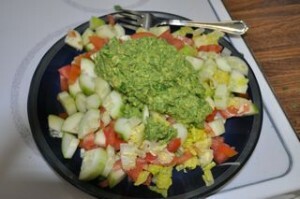 I cant wait for my raw food class so i learn some more and get more options. I think if i want to do this long term, i need a dehydrator. If i had to make a decision today, i would stay raw food vegan at home and be flexible when going out to dinner with friends or traveling. I could see how over time, i might drop that all together. And i would stay vegan eating on the road or with friends. Today i am down 3.5 pounds from yesterday for a total lose of 12.5 pounds since the start of this trial. I still have a bit of a runny nose but nothing that i notice too much. It is because my nose feels very clear and i can smell everything it feels like, then all the sudden, it gets stuffy. 5 minutes later, it is back to being very clear. Today, i was not hungry towards the beginning of the day. I did not eat until after 12. I had banana strawberry smoothies. A friend reminded me of how much i love cucumber goodness (cucumber, tomato, a little lettuce, topped with guacamole) and i feel in love with it all over again. I had this for lunch today, around 3 but i wanted it again around 7 for dinner. Unfortunately, i was out of cucumbers, so i had a avocado and tomato plate. yum. for dessert, i had an orange and some red grapes. I felt very happy and full! Up next is Lindsay’s entry. I wonder what she thinks of today. We are now 2/3 of the way through our nifty little trial. As I said before, yesterday was an interesting day. This is weird, but I don’t really remember much from the morning. I do remember that my period started (remember when I wrote about how awesome it was that it was light and pain free this month…apparently I spoke too soon.). I was in quite a bit of pain, but tried not to take anything for it, as the only pain relievers we have around here are not raw-vegan. I had something to eat, but it wasn’t long before I had to take something, because the pain was so bad. After a while I started to feel really sick. By the time night rolled around I was tired, in pain, felt like crap, and was a bit grumpy. I sat down to type my entry and it soon became apparent that I was having issues putting coherent thoughts together. The other factor was that I prefer to think before I say things and, while my moods and emotions need acknowledgment, I try to respond from them. This morning I let myself sleep a bit later than usual (to try to get me to feel better). I woke up about 8 am, but stayed in bed for a bit. I still didn’t feel well. I took more stuff for the pain and had some food. I started to feel worse and have gone up and down today. I did consider the possibility that one of the factors of my not feeling well was the pain reliever I took. I’ve never had problem with it in the past, but this extreme change in food may have made my body less accustomed to things of that nature. It makes me curious as to how I will do transitioning back to my usual foods. My stomach has been a serious problem the last few days. I am beginning to see a problem that when I don’t have enough food diversity my stomach is not happy. Over the last few days I have had very little food diversity. I have been consuming avocados, oranges, and tomatoes, primarily. Over the next couple of days I am going to try to eat more varied foods. A visitor from Holland was chatting with his American friend and was jokingly explaining about the red, white, and blue in the Netherlands flag. This entry was posted on Saturday, March 21st, 2009 at 3:10 am	and is filed under Raw Food. You can follow any responses to this entry through the RSS 2.0 feed. You can leave a response, or trackback from your own site. I like Lindsay’s joke. I’ve got to remember it.